Please visit back regularly for new updates & articles. In January 2010 when I lost my filly Z'Alshimmah, I was a bit too despondent to update this news page, but I intend to start catching up now. Please visit regularly to check for updates - thank you! However, I'm unable to add further news to this page, so please be patient while I create a new 2012 NEWS page. In the meantime, please follow Zuhra Arabian Horses and/or Zuhraan Pointers on Facebook - links on other pages. Kayo & Forrest's puppies were born just before New Year's - 7 pups: 2 solid black girls, 1 black & white girl, 2 solid orange boys & 2 black & white boys. Very sadly, one of the solid black girls died at 2 days old. The rest are thriving & are very cute!! Our one & only foal due for the season was born - a bay going grey colt by the Straight Egyptian horse "Halimas Egyptian Prince", out of "Zeehan Bint Nabila". Very leggy & typey, very friendly temperament like mum! 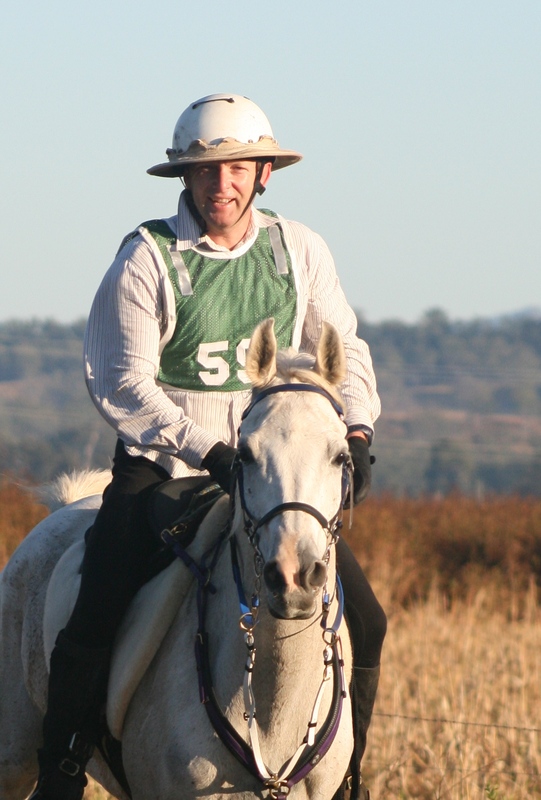 The tall, grey 2yr old straight Egyptian gelding "Sheridan Park Shamir" has been chosen to join our future endurance horse herd....bred by Karen Sheridan in South Australia, Shamir will make the journey to Zuhra Arabians in 2012. The owners of the cow we rescued during the January floods (see below) were traced using the NLIS ID tag in her ear. She'd been washed at least 20km downstream to our place! David & Laura Strong came to collect her today, and the local newspaper also came to document and publish it. All 36 of their cattle and 1 pony were washed away in the flood; about 30 of their cattle have been found alive and returned. The pony wasn't found but a kind soul in Gladstone sent them another. Link to article below - click here. Ipswich and Brisbane experienced a very major flood this week, preceded by flash flooding in Toowoomba and the Lockyer Valley that swept numerous people to their death....terrible. Even though our property is on the Brisbane River, being high on a hill we were not badly affected. However, our road went under water, we were flooded in and without power and phone for a few days. James spied a beast washed into our flooded back paddock, caught up in the tree tops (metres above ground level). With the help of neighbours Dave & Jo Andrews, the cow was reached using James' boat & pulled to dry ground by the tail. The Santa Gertrudis heifer was terribly tired, but has recovered well. Link to YouTube footage - click here. Only first part of rescue uploaded so far. Many more stock would have been lost during the flood. Zsarina Zoya presented us (in daylight hours again - thank you Zsarina!) with another colt, full brother to last year's colt. A very pretty chestnut with a lovely short head, the poor guy became constipated with his meconium, causing bad colic. He was rushed to the vet hospital with his mum at 2am on his first day of life (THANK YOU GEORGI KERT for helping!) and required numerous enemas. Home withing a few days and hasn't looked back!! He is for sale, and I will repeat the mating YET again to try for a filly! Love what this mating has given me, but I want to a girl to retain. Devastated to loose this special girl "Zuhra Z'Alshimmah" at such a young age.....she got diarrhoea for some reason and quickly developed colitis, leading to septicemia and severe laminitis within 2 days....quick, intensive veterinary care could not halt the progress. Shimmah's dam was "Zeehan Bint Nabila" (Sabtah Noah x Zeehan Nabila), and her sire the straight Egyptian, double Ruminaja Ali stallion "Alshinfarahh" (PVA Sonbali* x Dafiinahh*). 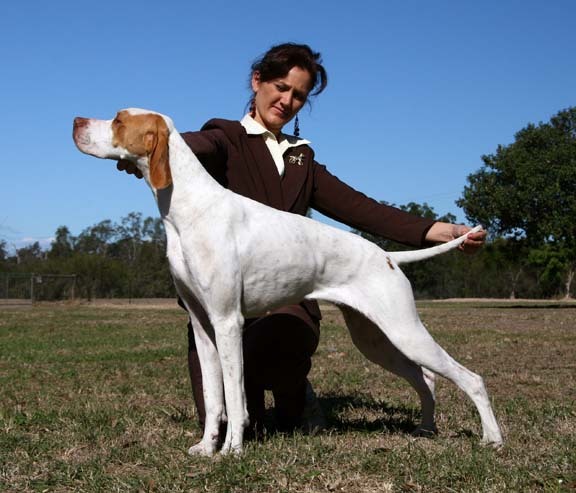 Zuhraan Dream Maker (Tintookie X Traspecial x Breilla Shenannigens) - "PJ" - was very sadly killed with his young Pointer playmate when they escaped their home in Hobart (Tasmania) & were hit by a car..... PJ was very much loved by his owner Claire McLaren: "We are absolutely devastated. PJ was the most amazing companion anyone could hope for and such a big presence in the house, it is just awful being home without him. 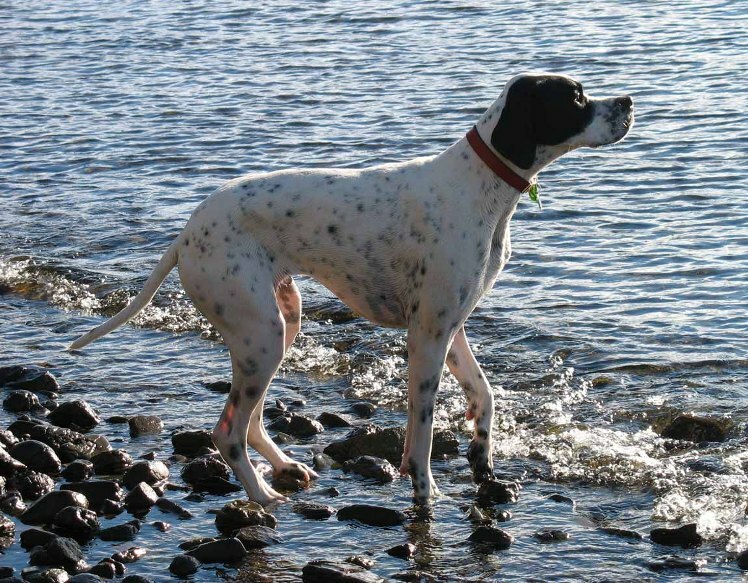 Thank you so much for breeding such an amazing dog, he was my best friend." 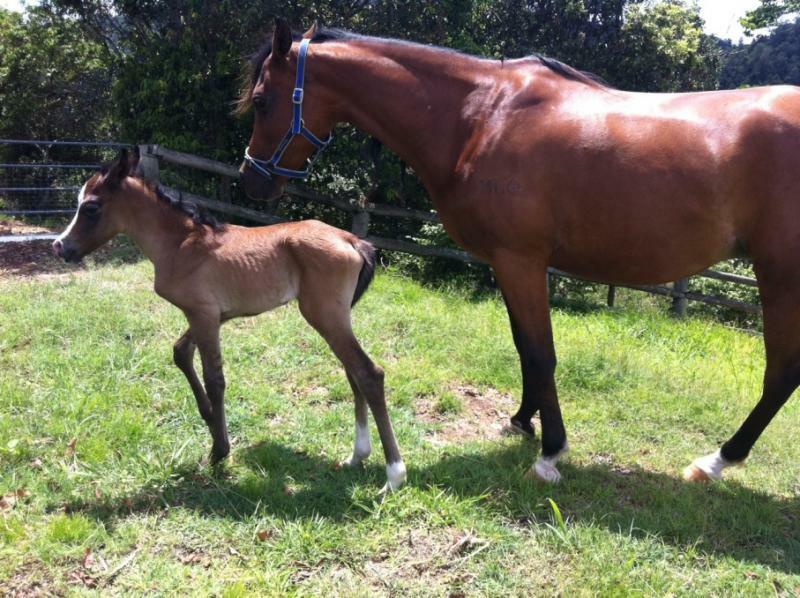 Maiden mare Zsarina Zoya foaled a gorgeous, strapping big bay colt - very politely in the middle of the day! He is mainly Egyptian-Russian bloodlines, with some Polish & Spanish too, being sired by classic stallion Simeon Sagiv. More photos will be uploaded to the FOALS page soon..... this colt is FOR SALE. The October 2009 issue of international publication The Arabian Magazine (UK) includes an Australasian feature and a story on Zuhra Arabians by Karen Sheridan! Hawley Arabians were also featured, amongst others. Subscriptions and back issues of the magazine are available via their website (see my Links page). A link to the Zuhra article shall be included soon. Liz (with 1yr old son Marcus in tow) was VERY lucky to be able to accompany husband James on his work trip to San Francisco (USA) for a week, and arranged to visit four Arabian horse stud farms - Los Acres, Jack Tone Ranch, Bishop Lane and Valley Oak Arabians. The weather was brilliant, the people were lovely and the horses were EXCEPTIONAL! My sincere thanks to the farms for gifting me their time to share their horses, and allowing me to take photographs. I shall post a link to some photos later, once I've had the chance to show the owners first. 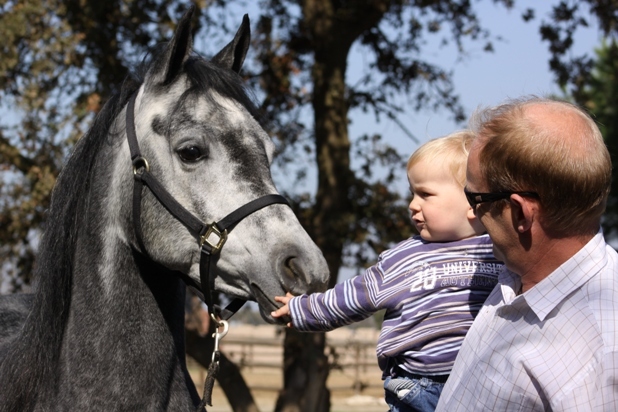 Photo above: Filly AIRISS (*Jair Tamaal x Magic of Sid) at Los Acres with Marcus & James. Purebred, classified poll Santa Gertrudis bull "Santalands Z38" (aka 'Holty') arrives on a 4 month lease, to breed our 5 cows. Calves will be due July - October 2010. Holty is a HUGE but quiet mature bull, of excellent type. Many thanks to his owner Mrs. Lois Dudley of Cyncoed Santa Gertrudis stud (at Glamorganvale). Many thanks to James' mum Christine & her friend Ron for coming along and helping with our kiddies, too! Very successful endurance gelding Zeehan Zamir (aka "Wilbur") has been ruled out of future endurance riding by vet, after spending 4 weeks there with septic tendonitis which resulted in lesions in his tendon. The infection occurred after a foot abscess - a 'freak' complication according to the vet. We are very disappointed, but he should be sound enough for pleasure riding. 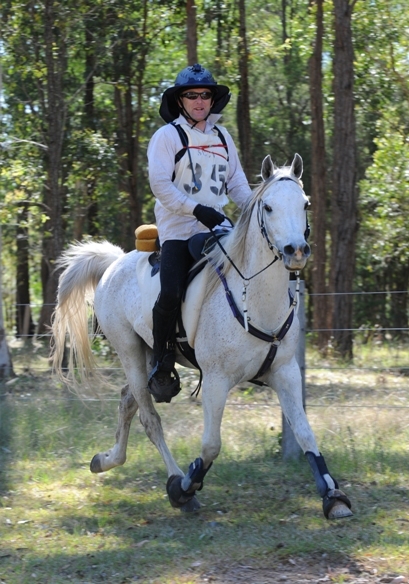 Pictured left is Zamir & James at one of their last endurance rides, in May 2008 at Kalbar. They placed 4th Heavyweight there. Before the 2008 Qld State Championships and the Quilty, Zamir bumped his front leg in the paddock & fractured the outer splint bone. It did not come good with rest, so was operated on in December 2008. Zamir was just becoming sound again & ready for work when the foot abscess occurred in May 2009. Liz rode Naadem on her first 40km training ride, at Spring Mountain. After 6 years out of the saddle due to having babies and strapping for James, it was a nice change! For Liz anyway! LOL. A shame the track was so muddy & the weather wet. "Zuhraan Catch A Dream" - Australian Champion! Zuhraan Catch A Dream - "Sunni" (Tintookie X Traspecial x Breilla Shenannigens) - earns her Australian Champion title! She is owned & exhibited by Alicia Kennison of Breilla Kennels, and is the dam of Zuhraan Dark N Dreamy. Green broken, young gelding Sheridan Park Shamir will begin his endurance training in 2014. No foals due in 2013-14 season :( but a few will be bred! Watch this space, and the Foals page!